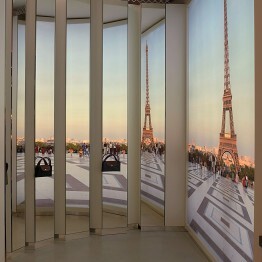 Within the Queens Road project in Hong Kong is the “Eiffel Mirror” installation created by Eric Carlson. The small semi-circular room contains a series of vertical mirrors radiating out at 170° to reflect the spectator positioned in the center. 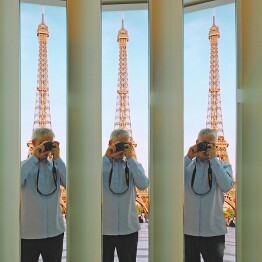 A lit backdrop image of the Place du Trocadéro and Eiffel tower situates the participant in a spectrum of perspectives within an unmistakably Parisian context.